For any bug report or feedback, please send an email to feedback [AT] ozone3d [DOT] net and add "[DEMO FEEDBACK]" to the subject. Processor: Pentium III or AMD Athlon and up processor - 800 MHz and up. 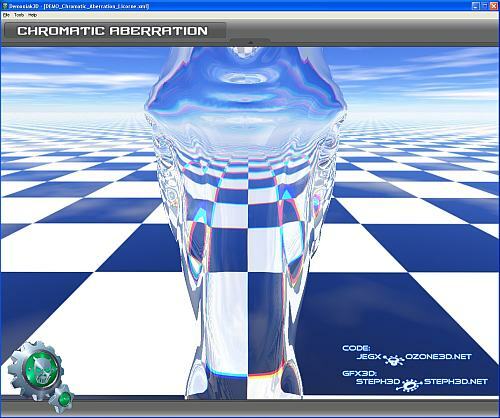 This demo shows how to implement with Demoniak3D the lighting dispersion effect also known as chromatic aberration. 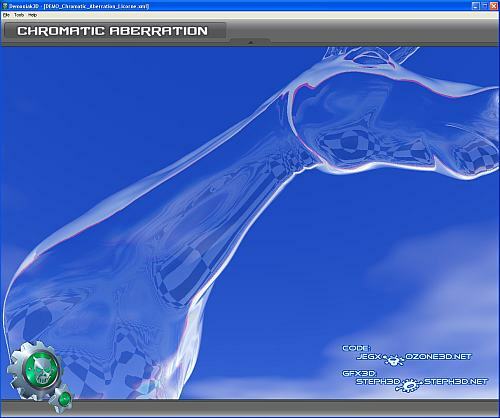 This demo has been adapted from the Refractive Dispersion sample provided with the nVidia SDK. The source code of the demo is located in the DEMO.xml file. 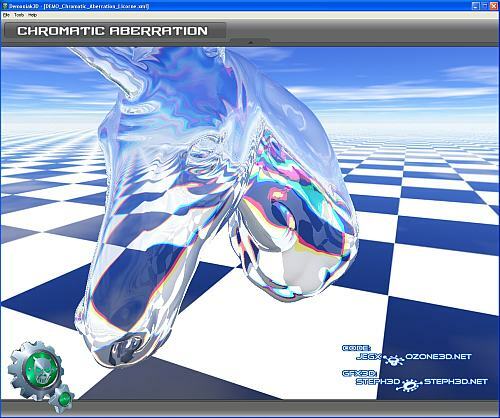 This file contains the GLSL shader that does the reflection / refrection effect (just search for 'chromaticAberrationShader'). This demo requires an OpenGL 1.5 compliant graphics controller. Unzip the archive and launch START_DEMO_Licorne_Unicorn.bat or START_DEMO_Torus.bat. That's all! Demos's source codes are in the next files: DEMO_Chromatic_Aberration_Licorne.xml and DEMO_Chromatic_Aberration_Torus.xml. 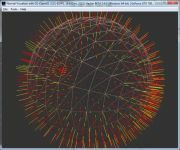 You can download Demoniak3D Demo-System here: [Demoniak3D DOWNLOAD]. Page generated in 0.0015859603881836 seconds.